2017 Volvo S90: Is This Volvo's New Flagship? 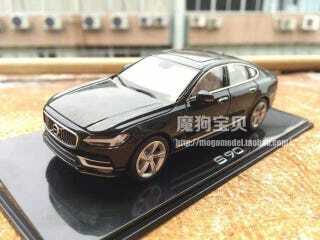 The Volvo S90 is the brand’s return to building flagship vehicles that we’ve been waiting for and this image above is allegedly it. Why allegedly? Well, the source of these photos, actually, is almost as interesting as the car itself. All big-car design looks roughly similar, and this Volvo definitely looks like a big car albeit with a few interesting Swedish touches. First, it definitely draws inspiration both from the new 2016 Volvo Xc90 and the Volvo Estate Concept. Additionally, is that an A7-style hatch in the rear? Could we get a flagship with a hatch? I hope so, although it’s difficult to ascertain from this photo. The taillights are also an interesting touch. So, what the hell are these photos? If the images are to be believed, they are scale models from a Chinese model site. This makes sort of double sense as the vehicle is produced by a Chinese-owned company (Geely) and the models themselves are probably built in China. The car is also intended for a Chinese audience, in addition to its global launch. The images appeared on the private Volvo Model Cars Facebook page, which understandably has a healthy presence of Swedish members. One of them claims to have reached out to someone in Gothenburg, who granted them permission to run the photos of the model. We can’t verify this and I’m afraid that the email I sent to Volvo asking them to confirm it makes me sound like I’m drunk (It’s the freakin’ weekend, am I not allowed to have me some fun? ), but hopefully they respond soon. If it’s real, what do you think?